Soft, warm, and stylish infinity scarf hides an inflatable pillow to make travel more comfortable. 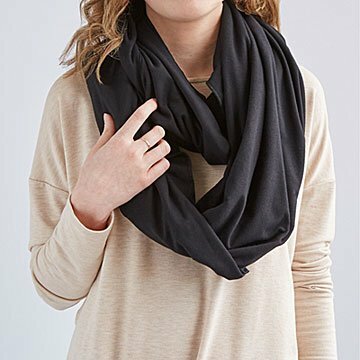 Take a red-eye without getting literal when you wear this soft, warm, infinity scarf on the plane. Its stylish exterior hides a secret weapon: a U-shaped, zippered pocket around the neck that holds an inflatable travel pillow in place. Lightweight and compact, the interior pillow isn't noticeable until you use it. When you want to catch some shut-eye, unzip the pillow and blow a few puffs of air to inflate it. The soft, warm scarf will protect you from the chilly in-flight air, and the pillow will help you slip into sleepytime so you can arrive at your destination refreshed and well-rested. Available in black or grey. Made in Los Angeles, CA. Remove pillow before washing. Machine wash with like colors. Dry flat. It was difficult to blow up, but I found if you squeezed hard enough and took your time it inflated, and kept the inflation. Perfect for traveling!! Temperatures are constantly changing from trains, to planes, and into cars but this scarf/pillow is great as it provides a little added comfort along with the ability to take the chill away for any direct air. Clearly wearable with anything and folds nicely into bag. Friend who received was very happy! The material is really soft and comfortable. The pillow is masked well when only using as a scarf. I would like for it to be longer and wider so that it could also function a bit as a blanket on a cold plane as opposed to just a scarf. Love the quality and design of the product only dofficulty is to blow it. Just bought a second one for my other daughter. Very unique gift - my extremely practical and pragmatic wife likes and uses the scarf!